The Various Types of SEO Tools and What They Can Do for You! One of the main assets of any modern business is a website. Having some presence on the Internet cannot be stressed enough. Consumers head to the Internet first whenever they are searching for a product or a service. If you are not one of the first links they see when they make a search, then your business needs to step up its website optimization. Once you establish a business website, then you should go right ahead to perform Search Engine Optimization (SEO) on it. SEO is a series of steps that are performed on your business website so as to make it rank higher in the search engine results. It is important to rank high and emerge in the first page of the search engine results. It is a proven fact that Internet users rarely go to the second or even third page of results when searching for things online. As such, the first page is the place to be so as to attract clicks and possibly even revenue. You can perform this website optimization on your own. On the other hand, you can hire professional SEO technicians. All these strategies can be accomplished with the assistance of a number of tools. Also known as applications, there are some special programs that are made to help webmasters or SEO specialists to optimize websites. Read on to learn about them. What Are SEO Tools and Which Types Are There? You can download and use the free tools for as long as you want indefinitely. Freemium tools offer you full access to their features for a set amount of days. This period is known as the trial period and often lasts 30 days after installation. Once the trial period is over, you have to buy the tool to keep using it. Paid tools are just as their description indicates; you have to buy them before you use them. Keywords are very important in SEO. This is because they are the ones that Internet users enter in the search engine box. Thus, if your website has that particular keyword or key phrase, it will appear in the search results. This is how important they are to an SEO effort. Now it is possible to find the ideal keywords for your website. There are tools that will provide you with data that you can use to find the ideal keywords for your website. One of the free tools that you can use to find keywords for your website is known as Ubersuggest. It will suggest keywords that you can insert into your website so as to optimize it. 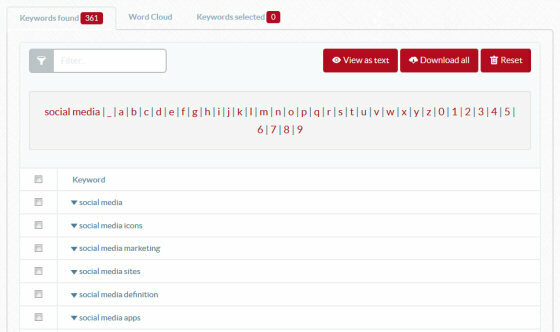 Once you query it, this tool will provide you with a list of keywords that you can utilize. A freemium tool that you can use to get some keywords for your website is Term Explorer. The developers of this tool indicate that it has the biggest repository of data of any keyword tool. You can expand lists of keywords, collate the volumes of search data as well as comprehend the competitiveness of the keywords that it suggests to you. 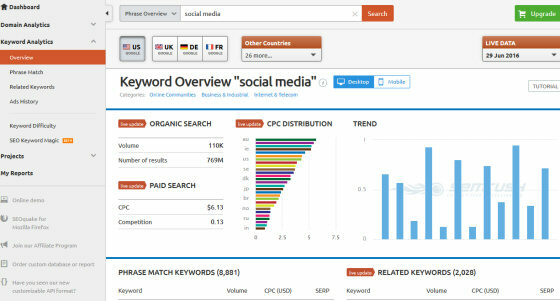 SEMrush is a paid tool that you can use to find some keyword data to apply in your optimization effort. By using this one, you can find keywords to use, discover the keywords that your competition is using as well as the ideal landing page where you should place your keywords. This tool also informs you of the value of the keywords that you use. PageRank is the whole point of SEO. It is about improving the rank of your page in the search results. The first step in page ranking is identifying your current rank. After that, you can measure your progress after performing SEO. There are tools that help you track your rank in the results. This helps you to know which of your SEO strategies is the most effective. It also helps you to measure your Return on Investment (ROI) and assists you to see the growth rate of Internet traffic to your website. A free tool that you can use to accomplish this is known as the Google Search Console. The search engine has a collection of programs that you can use to monitor the performance of your website. These are available under the 'search Traffic' and the 'search Analytics' tabs. Once you access these tools, they will show you which keywords you are ranking for. You can sort them and find the ones that are ranking in page 2 of results. By taking them and leveraging them properly in your website, you will find yourself ranking on the first page in a short time. A freemium tool that you can use is known as SEMrush. This tool gives you access to ranking data. You can use it to track domains or keywords from anywhere in the world. In this way, you can uncover any local competition to your website. Moreover, you can tailor your SEO efforts to target specific devices by using SEMRush. Authority Labs is a paid tool that you can use to track keywords and rank them. It is able to provide you with ranking lists or reports of keywords. You can program it to provide you with these reports every week. SEO is a necessary activity to perform on your website. There are professional technicians who can perform this task for you. The tools indicated above are effective for optimizing your website and boosting your rank in the search engine results. Barrack Diego is an SEO expert. He has optimized websites for over five years and has immense experience working with YouthNoise.com . Thanks to his skill, he is often quoted in IT magazines and reports whenever the topic of SEO is at hand. He generously contributed some of his knowledge in this report.